Get away from the crowds and skyscrapers and learn about some of the historic immigrant neighborhoods on Manhattan’s Lower East Side on this private walking tour. 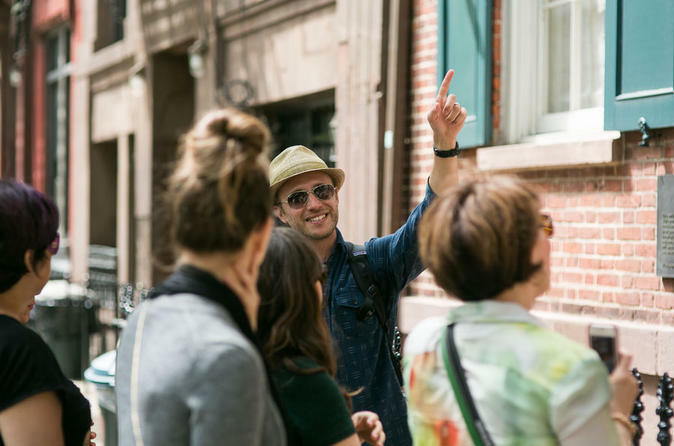 We’ll discover the rich history of the area and discuss the Dutch, Jewish, German, Irish, and Italian influence as we explore the East Village, NoLita and Little Italy. Along the way, we’ll take an ale break at NY’s oldest surviving Irish pub and sample a tasty pastry at a traditional neighborhood bakery. Finally, we’ll wrap up with delicious mozzarella cheese and prosciutto samples from a 90-year-old specialty store in Little Italy. Enjoy beer, history, and local flavor. On this private walking tour, we'll start off at Astor Place and discuss beaver belts, real estate, and America's first multimillionaire whose name became synonymous with enormous wealth. The group will proceed to the East Village and learn about Peter Stuyvesant, the peg-legged man who surrendered New Amsterdam to the British. Your guide will explain about New York City's Dutch past as you stroll through one of New York's smallest historic districts. From there, you will walk down Second Avenue, which has been home to large communities of Germans, Russian Jews, Ukrainians, and everyone in between. Take a break and absorb all of this information by stepping into a 163-year-old Irish pub with saw dust on the wooden floor. After some ale and friendly banter at McSorley's Old Ale House, you will head down the Bowery, once synonymous with bums but now home to trendy hotels, restaurants and boutiques. On the Bowery, you'll learn about Joey Ramone and CBGB's, the famous punk rock music venue. The next segment of the tour will take you into trendy NoLita, once home to a huge Italian population. Your guide will discuss the Italian past and influence, as well as the area's transformation. You will see what is left of Little Italy and learn a bit about the Italian immigrant experience in New York. You'll also discover some beautiful NYC street art. The tour will end with a delicious treat at a 90-year-old neighborhood staple in the heart of Little Italy, Di Palo's, where customers will taste homemade mozzarella cheese and imported Italian prosciutto. Choose between a 3-or-4-hour tour with just you and your party. You'll soak up the street scene and neighborhood life away from skyscrapers and tourist crowds, while learning a lot about the great melting pot that is New York City. Beer, history, snacks, culture and sightseeing -- the perfect walking tour.